If you find yourself with a tax debt, it is important to know about the conclusive evidence rule. You need to know that a tax debt is not like most other debts. Tax debts have a special status under the tax law. This special status weighs in the ATO’s favour. Usually, if a creditor wants to take you to court to collect an unpaid debt, the creditor must prove to the court that you owe the debt. They do this by showing copies of contracts, invoices, etc. If they can’t prove it to the court, then they lose. Things work the other way for most tax debts. For most tax debts, if the ATO wants to take debt collection action against you, it doesn’t have to prove that you owe the debt. It doesn’t even have to prove that the amount it is trying to collect from you is correct. This is because of something known as the conclusive evidence rule, which is part of the tax law. The conclusive evidence rule states that, when the ATO gives you a Notice of Assessment under the tax law, this is conclusive evidence that the assessment was made properly and the amounts in the assessment are correct. This means that if the ATO starts court proceedings to recover a tax debt, the Court has to accept that the amount in the Notice of Assessment is correct. It cannot question it. The Court must abide by the tax law and this means, it must apply the conclusive evidence rule. If you don’t agree with a Notice of Assessment, then you have the right to challenge it. You can do this by lodging an objection. If this doesn’t work out, then you can file an appeal in the Administrative Appeals Tribunal or the Federal Court to take things further. This is a specific process set out in the tax law. It is the only way you can challenge an ATO assessment. “The fact that a review is pending in relation to a taxation decision does not in the meantime interfere with, or affect, the decision and any tax, additional tax or other amount may be recovered as if no review were pending”. This means that, even if you are disputing the tax debt (i.e. by lodging an objection, or filing an appeal in the Administrative Appeals Tribunal or the Federal Court), the ATO is still allowed to chase you for the debt through the courts. There are usually other ways to deal with the debt, but this needs to happen by negotiating with the ATO. A court won’t be able to accept “but I’ve lodged an objection” as a defence to any ATO debt recovery action. The law doesn’t allow it. The best thing you can do when the ATO is taking you to court for a tax debt is to get advice quickly. The conclusive evidence rule makes it hard for you to fight back. But there may be other options available to you – depending on your particular case. A tax dispute expert can review your options and negotiate with the ATO on your behalf. I’ve helped many clients to sort out their tax debt, even after the ATO has started legal action. For an example of this, read a case study about my client George, who I was able to save from the brink of bankruptcy. I work with clients all over Australia. I can do this because the tax issues I deal with are Federal – the law is the same no matter where in Australia you live. The ATO sent a garnishee notice to my bank – now what? 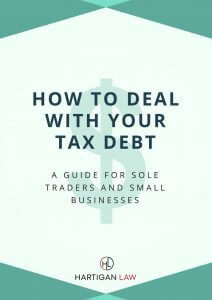 Click below to download your free 20-page eBook and learn how to reduce your tax debt and negotiate a payment plan with the ATO.